Results of a recent survey show smoking to be rampant among the youth of Estill County. But it’s tobacco products, not marijuana, that’s the biggest concern. The survey was given to students in grades six, eight, 10, and 12, and the results presented Monday night at a community forum on drugs. Self-reported tobacco use among youth was higher than figures for the region and state among all grades, and 10th grade data significantly higher than the region or state. Thirty percent of 10th graders reported using tobacco products, compared to 23 percent in the region and 24 percent in the state. 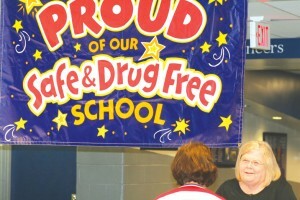 The good news is that drug use has declined in the past two years, according to Robert “Skip” Johnson, Estill County Safe and Drug-Free Schools coordinator, and director of pupil personnel. Only 12 percent of Estill’s 12th graders reported having used marijuana in the last 30 days before taking the survey, compared to 18 percent in the region and 15 percent in the state. The survey shows inhalant use to not be a big problem here, however grades 8 and 12 are one percent higher than the region. Use of prescription drugs among 10th and 12th graders is significantly lower than region and state figures. Only four percent of Estill 12th graders reported using these too easily obtainable drugs, while the figure is nine percent in the region and state. Early use of Oxycontin is a concern here, with one percent of sixth graders reporting use, while there is zero percent for the state and region. One of the most positive findings is that tranquilizer use has taken a major drop since a report issued in 2006. In 2006, seven percent of 10th graders reported use, and that figure has fallen to one percent. Usage among 12th graders has gone from four to one percent. A copy of the survey will soon be made available at the Estill County Public Library. Thanks to greater awareness of the dangers of drugs through community programs, great strides have been taken in keeping drugs out of the schools, Johnson noted. Having a passive drug dog available through widespread community support has also been a factor in helping keep Estill schools drug-free. “We just don’t see a lot of drugs here (at Estill High) or at the middle school,” he said. Also presenting information at the forum were Jennifer Shepherd, nurse practicioner at White House Clinic in Irvine, and Angela Springs, a pharmacist in Richmond and Irvine. Both addressed the importance of reducing the abuse of prescription drugs by disposing of them properly after they have served their intended purpose. One effective way of disposal is to mix the drugs with kitty litter or sand, and throw them away in the garbage. The community forum, which drew only about 15 people despite widespread advertising, was put on by the Area Substance Abuse Policy (ASAP) board, and the Estill County Prescription Drug Abuse Prevention Coalition. Sharon Hensley, coordinator of both programs, says efforts are ongoing to reduce the abuse of drugs in Estill County. Community wide awareness of the battle against drugs will be greatly enhanced soon when a dozen life-size cardboard displays of students are placed in schools and in the windows of businesses.